BRASÍLIA, BRAZIL – Brazilian air traffic control should improve its communication with planes flying over the Atlantic Ocean, recommended the final report on the Air France jet that crashed in 2009, after taking off from Rio de Janeiro killing 228 passengers. 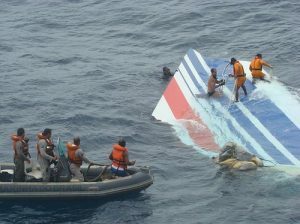 Wreckage is recovered following the 2009 Air France flight 447 crash, photo by Louis Volant/Wikimedia Creative Commons License. The Air France Airbus A330 plunged into international waters in a region with no radar coverage and little access to radio communication in June 2009 after taking off from Rio’s Galeo Airport for Charles de Gaulle in Paris. The final report by the Bureau of Investigations and Analysis (BEA) in Paris, released Thursday, said that the lack of satellite monitoring by Brazil’s air traffic control system led to a delay in realizing the plane was missing and hindered the search for wreckage and victims. The report analyzed information from flight data recorders recovered two years after the tragedy and concluded that a combination of human error, poor training and technical failure were to blame for the 2009 disaster. Ice crystals caused the auto-pilot to disconnect, and the pilots did not understand what was happening when the jet stalled and began to fall, the report said, concluding that the pilots were not adequately trained for this type of scenario.